Your boss handpicks you for a complicated long-term assignment. You handle it in a timely and perfectionist manner. He accepts it as such and you giddily cash your bonus check and look forward to some appreciative sack time at home. Then that cretin of an employer calls in an outside contractor. This cheeky individual casually works over your magnum opus with a bit of surgery, far exceeds the original parts cost budget you'd been forced to remain within and goes on to book all the credit and glory. Would you be ready to break a certain dust-ridden commandment that haughtily talks about "thou shalt not kill"? Who's called thou anyway - and what did that world-weary Moses know about overpopulation? That's how designers and purveyors of certain high-performance value-priced audio must feel when they see their pride and joy hawked in improved guise by some Internet solder jockey. Such items are always described as trouncing the original. This is especially blood-curdling when your original has garnered plenty of positive reviews. Can you say parasitic leeches? Not hotrodded to the hilt but pissed to the max might suddenly seem the most opportune reaction to such effrontery. After all, you designed the main architecture, the board, the enclosure and even paid for the marketing. How dare Joe solder slinger ride your coat tails now and openly insinuate that you cut corners and did a half-assed job? (Of course, this is merely one way to regard this subject. I could just as convincingly argue the opposite and in favor of the end user who can obtain peak performance for less than peak pricing). All this by way of prefacing that getting chosen for modification upgrades these days is a powerful if somewhat backhanded compliment. The audio modification business has grown into a thriving underground scene. Denon universal machines, Music Hall and Shanling players, Unison Research Unicos, T amps and other wildly popular items are being overhauled while the originals enjoy renown and desirability. When the fickle winds of fashion change direction, the modifiers abandon yesterday's darling in favor of the latest 5-minute fame-ster without capital losses in inventories and tooling. 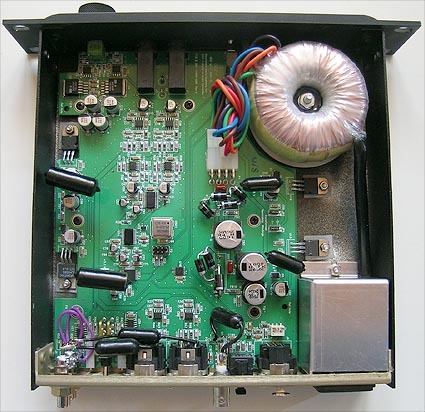 To this list of popular contenders for the modification biz now add the $995 Benchmark Media DAC-1, a bright star in the recent firmament of cost-effective overachievers. There's no shame in being bested by a genetically hotwired twin who had the benefit of expensive designer parts that double the original target retail price. It means the basic architecture was sound and merely hamstrung by budgetary constraints. Say hello to a $2,000 DAC-1 then. Its innards have been worked over by Stephen Balliet, not just any solder jock but the bona fide designer of his very own preamplifier, the Reflection Audio OM-1. 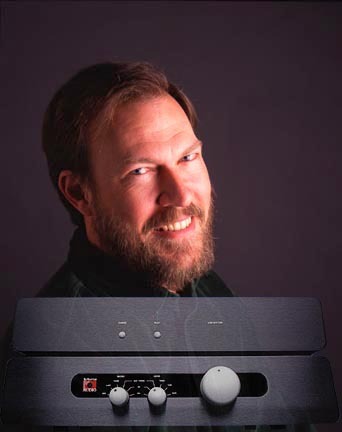 Jack Bybee is part of the Bay Area insider crowd of hard-core audiophiles and thus by definition also part of Balliet's circle. Consequently, the Quantum designation of Balliet's hotrodded own preamp points at the use of Bybee devices. Ditto for the DAC-1 Reflection Audio modification. As I said in my review of the stock DAC, the modified unit's "only external giveaway is a pair of Cardas RCAs. As per Stephen's included menu, the mod performed on the submitted machine includes overall cryogenic treatment; Stillpoints' ERS cloth shielding for the power supply section; fast soft-recovery diodes; and a plethora of Bybee devices (2 for analog power, 2 for digital power, 2 for unbalanced audio out, 1 for coaxial digital input). Not included but available are Bybees on the balanced digital input, a low-impedance output driver, super-low impedance analog power regulator boards and a new analog output which would add a further $1000 to the final bill." Though their explanations, dumbed down for us consumers, may reek of left-field pseudo physics, many ears in the biz stand behind Bybee Quantum Purifiers. Our own Paul Candy presently finds himself plugging and unplugging components into and from various passive BPT power bars. One of them includes optional Bybee devices. Paul reports an obvious audible signature and personal preference much reminiscent of my own experiences with Walker Audio's Velocitor S. However this stuff does what it does, it does it. (That's a lot of does for one sentence, don't you think?) What remained to be determined in today's instance was what that does would sound like. If you recall, my take on the stocker was exceptional transparency but also a somewhat mechanical, dry and sterile presentation that, for my tastes, erred on the just-the-facts-ma'm side but had tremendous HF detail. Admittedly, this from a guy who listens to tubed DACs. I felt that the stocker overemphasized transients in favor of subsequent bloom, thereby shifting the leading edge/sustain/decay trinity into its first third for a bit of textural imbalance. If one could retain the see-forever transparency but redress this balance, a hotrodded DAC-1 could become a contender for the big leagues. Would Balliet's changes work in this particular direction or explore unexpected sonic terrain? Incidentally, the ERS cloth which shields the power supply half of the board must be placed just so or you'll have audible distortion. Distortion is what happened to me after I took the above photograph and put the chassis cover back on. This StillPoints product is powerful and must be applied/placed just so (and as Steve Balliet clearly had done until this reviewer messed with his recipe). Using the mighty Zanden Audio Model 2000P for transport duties via Serguei Timachev's Sextet BNC/BNC digital interconnect (essentially six Stealth Audio Varidigs paralleled in a rotated configuration), I had both the stock and modified Benchmark Media units powered up and could switch between the two in less than a minute. To take a quick temperature reading on my patients, I cued up Kavi Alexander's stupendous Mahler 5th [WaterLily 76], one of the most natural sounding classical recordings ever (including endless audience coughs from likely chronic chain smokers and an idiosyncratic orchestral layout due to the unusually shallow stage depth of the Great Hall of the St. Petersburg Philharmonic, causing the brass to sit hard right and firing laterally across the orchestra). Want to test dynamics, soundstaging, tonal balance and individual instrumental timbres? You can't do better than this, never mind the truly inspired performance recorded live to analogue and on location in Russia. The difference wasn't subtle. 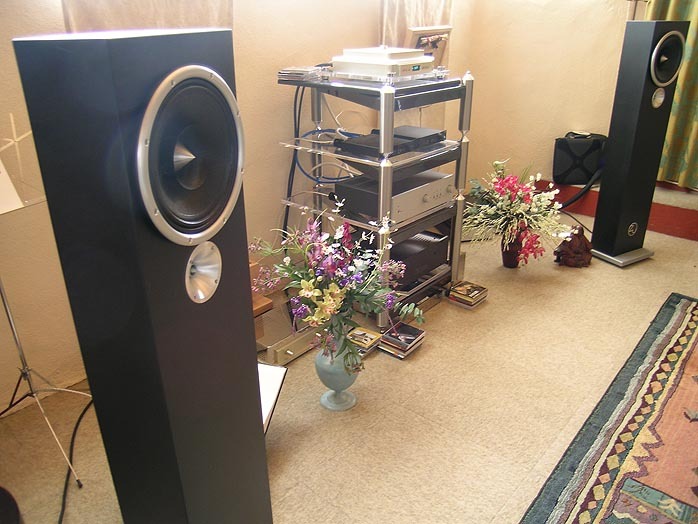 The Reflection Audio unit sounded considerably bigger and fuller, its soundstage deeper while simultaneously projecting a lot more forcefully into the room. Part and parcel of the 'bigger & fuller' picture were clearly enhanced dynamics, dead-obvious on a piece as dynamically intense as the famous opening dirge of this symphony. The stock unit seemed restrained and shut in by comparison. The Quantum Purifiers thus acted as By-beef-ication. It strategically addressed the weaknesses of the stock unit - a sense of mechanicalness and spatial compaction. The modification worked like an expander both in the spatial and dynamic domains. This observation held constant no matter the playback material (which for these sessions included Yuval Ron's One [Magada 38] with Omar Faruk Tekbilek, Yair Dalal and Azam Ali, a must-have for fans of Tekbilek, Steve Shehan and Mercan Dede.) When we question what causes certain components like SETs to have more presence than others, it's often related to how microdynamics, imagine density and sheer size create a larger sense of scale and thus, greater listener involvement. That's exactly how Balliet's unit pulled ahead of the stock one. While it might piss off certain observers that some 'magic' black droplets could have this effect on an otherwise identical circuit and double its retail price, the fact remains that post-op, this patient now will please even those listener who usually prefer valves for the above reasons. 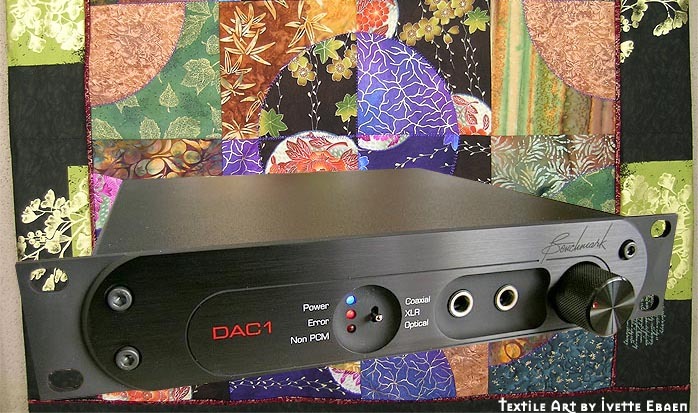 The slight dryness and concomitant sharpness of the unmodified DAC-1 mysteriously rectified, Balliet's version sounds both softer and fuller at the same time. Without sacrificing any resolution, the fascination with resolution -- which the stock unit clearly inspires -- is replaced by a more colorful involving presentation. Don't ask me how or why these strategically placed Bybee devices and soft-recovery diodes would have these particular effects. I'm reasonably certain that just as with the ERS cloth, it's vitally important to know just exactly where to use 'em and how many so as to not overdo things or move into the opposite direction. Though I somehow wish a handful of esoteric parts and their installation were cheaper, I can't argue with the results here. Those who already own a Benchmark DAC and one day hear it bested over at a friend's house to feel compelled to reenter the audiophile rat race... well, those folks might contact Reflection Audio instead. Have what you already own taken to the next level rather than sell it at 50 cents to the dollar for the latest/greatest flavor du jour. Clearly, the affordable Benchmark Media DAC-1 is one of those ultra-solid platforms that lend themselves to great things when cost constraints are lifted. Let me put it differently. I'm an unapologetic Zanden and Audio Aero man. In that vein, I'd rather live with the very affordable Eastern Electric MiniMax than the stock Benchmark even though the latter is clearly more resolved. I would, however, much prefer the modified Benchmark to the MiniMax in my big rig since it ups the Eastern Electric's resolving power without undoing what makes it so special in the first place. Getting there without tubes in a tiny box that also adds two headphone outputs? In my book, that's a very appealing proposition indeed.